It is two things to watch out for tomorrow. First of all we have the U.K snap election, and then we have Former FBI Director James Comey who will appear before a Senate panel in his first public testimony since President Donald Trump fired him. Theresa May shocked the world with her «emergency election», and the decision seems to be very odd. But there is no doubt that this election is all about “Brexit”. Boris Johnson said only May can fix Brexit. 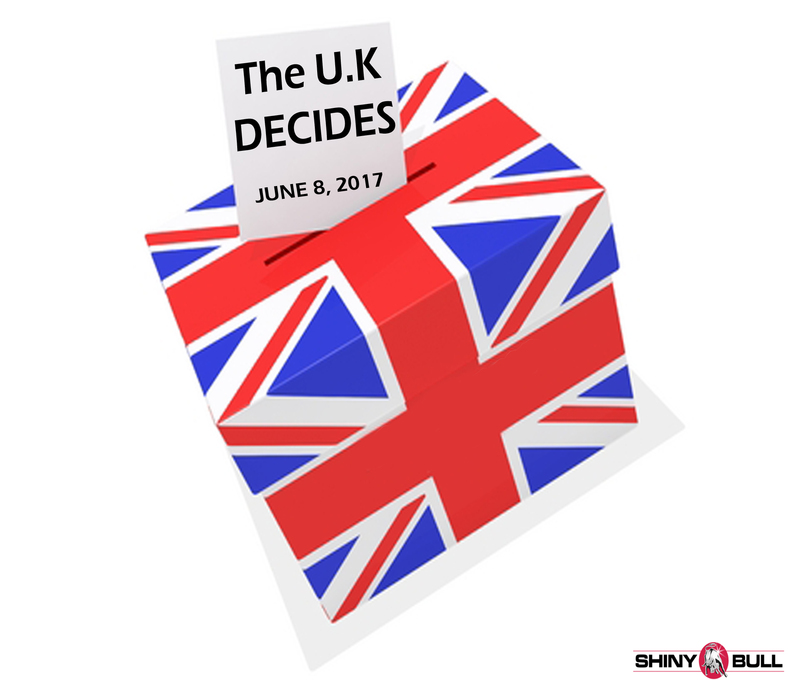 This is very important to investors as the “Brexit” decision and the outcome of the snap election is a make or break in the market. Take a look at the market. Investors has poured billions of dollars into the European stock market. The tension is high and there is no secret that someone wants to kill “Brexit”, and if they succeed, the market will crash and burns. The other outcome is when “Brexit” lives which means a huge rally for the rest of this summer. Investors are on the edge again. The death of “Brexit” could plunge Europe into chaos. According to BBC, there is a shift in the campaign patterns of both parties after a May U-turn on social care funding. But in the wake of the Manchester and London terror attacks national polling averages have shown that Mays Conservatives retain a solid lead over Corbyns Labour. Polling average puts Labour 9 points behind the Conservative party. Conservatives 45% and Labour 34%. May`s majority can be wiped out with a 2 percent swing from the Conservatives to Labour and Labour will gain 10 seats. But we have learned from the polls before “Brexit” last year that the polls in the U.K is not perfect, which means a lot of things can happen. In addition to the election, we also have the Popes private meeting with Britains top brass. A financial «Fault line» which is worth billions and ready to crack open on June 8. I`m not gonna talk more about that but rather say something about James Comey who will testify on June 8. This is the first testimony since Hillary Rodham Clinton`s testimony to a House committee investigating the 2012 attacks in Benghazi, Libya. The Benghazi committee hearing came to an end after 11 hours. Comey will speak to an open hearing of the Senate Intelligence Committee followed by a closed session. The hearing is part of the panel`s probe into alleged Russian meddling in the 2016 election and any possible ties between the Trump campaign and the Kremlin. Comey was abruptly fired last month while overseeing the FBIs own investigation of alleged Russian interference. The White House has given shifting explanations about Trumps motives for firing Comey. The administration initially said Trump acted on the Justice Department`s recommendation, though Trump himself later said he would have fired Comey «regardless» and was thinking of the «Russia thing» when he decided to do so. JUNE 8 IS A GREAT DAY! Today, on 13 May 1981, the fires attempted assassination of Pope John Paul II took place in St. Peter`s Square at Vatican City. The Pope was shot and he was struck four times and suffered severe blood loss. Who can do things like that? The man behind this assassination attempt is Mehmet Ali Agca, born January 9, 1958, in Turkey. Agca has described himself as a mercenary with no political orientation, although he is known to have been a member of the Turkish ultra-nationalist Grey Wolves organization, which is a militant fascist group. Agca was quoted as saying that «to me the Pope was the incarnation of all that is capitalism,» and attempted to murder him. John Paul II (born Karol Jòzef Wojtyla) is born in Poland and was the first non-Italian pope since the Dutch Pope Adrian VI, who served from 1522 to 1523. John Paul II is recognised as helping to end Communist rule in his native Poland and eventually all of Europe. He significantly improved the Catholic Church`s relations with Judaism, Islam, the Eastern Orthodox Church, and the Anglican Communion. His wish was «to place his Church at the heart of a new religious alliance that would bring together Jews, Muslims and Christians in a great religious armada. John Paul II had good relations with the Armenian Apostolic Church, and in 1996 he brought the Catholic Church and the Armenian Church closer by agreeing with Armenian Archbishop Karekin II on Christ`s nature. During an audience in 2000, John Paul II had Karekin II, by then head of the Armenian Apostolic Church, issued a joint statement condemning the Armenian genocide. The Armenian Apostolic Church is the world`s oldest national church. It is part of Oriental Orthodoxy and is one of the most ancient Christian communities. Armenia was the first country to adopt Christianity as its official religion in the early fourth century (traditionally in 301) in establishing this church. The church claims to have originated in the mission of Apostles Bartholomew and Thaddeus in the 1st century and is an early center of Christianity. It is sometimes referred to as the Gregorian Church but this name is not preferred by the church itself, as it views the Apostles Bartholomew and Thaddeus as its founders, and St. Gregory the illuminator as merely the first official governor of the church. Between the 16th and early 19th century, the traditional Armenian homeland composed of Eastern Armenia and Western Armenia came under rule of the rivaling Ottoman and Persian Empires, passing between the two over the centuries. By the mid 19th century, Eastern Armenia had been conquered by Russia, while most of the western parts of the traditional Armenian homeland still remained under Ottoman rule. During World War I, the Armenians living in their ancestral lands in the Ottoman Empire were systematically exterminated in the Armenian Genocide. After almost 600 years of statelessness, Armenia achieved Independence in 1918; however, the First Republic of Armenia, surrounded by hostile countries, was Sovietized in 1920. Between 1922 and 1991, Armenia was part of the Soviet Union. The modern Republic of Armenia became independent in 1991. 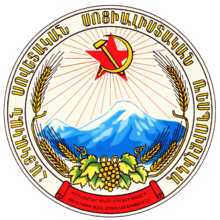 (The coat of arms of Soviet Armenia depicting Mount Ararat in the center). The church struggled under Soviet rules, and suffered greatly under Stalin. Fears decreased when Stalin died in 1953, and the new era with Nikita Khruschev changed peoples life in Soviet Armenia. They began to see rapid improvment. During the Gorbachev era of the 1980`s, with the reforms of Glasnost and Perestroika, Armenians began to demand better environmental care for their country, and Gorbachev collaborated much with John Paul II. Pope John Paul II was born in 1920 and faced deportation in Poland by the Germans, probably because he was of Jewish descent. So, he took a difficult Laborer`s job in a Stone Quarry to escape deportation and imprisonment. He also worked in War Chemical Plant to escape 1944 deportation. He worked in a chemical plant until August of 1944. His father died of a heart attack in 1941, and at the age of twenty he had already lost all the people he loved. 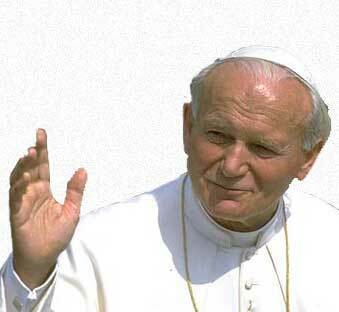 Wojtyla was the immediate family`s only surviving member. He was not at his mothers, brothers or fathers death. When he became pope in 1978 at the age of 58, John Paul II was an avid sportsman. He was extremely healthy and active, jogging in the Vatican gardens, wight training, swimming, and hiking in the mountains. He was fond of football. On 1 May 2011, Pope Benedict XVI attributed one miracle to John Paul II; the healing of a French nun from Parkinson`s disease. A second miracle attributed to John Paul II in 2013, confirmed by Pope Francis. (Two miracles must be attributed to a person to be declared a saint). In the years since his death, John Paul II has since been made a saint by the Roman Catholic Church. He is referred to by Roman Catholics as Pope Saint John Paul II or Saint John Paul the Great. The three popes who today commonly are known as «Great» are Leo I, who reigned from 440-461 and persuaded Attila the Hun to withdraw from Rome; Gregory I, 590-604, after whom the Gregorian Chant is named; and Pope Nicholas I, 858-867. John Paul II the Great is only the fourth pope to be so acclaimed, and the first since the first millenium. When Pope John Paul II kissed the ground at the Warsaw airport he began the process by which Communism in Poland and ultimately elsewhere in Europe would come to an end. On later trips to Poland, he gave tacit support to the Solidarity organisation. These visits reinforced this message and contributed to the collapse of East European Communism that took place between 1989/1990 with the reintroduction of democracy in Poland, and which then spread through Eastern Europe (1990–1991) and South-Eastern Europe (1990–1992). John Paul II was the catalyst for «a peaceful revolution» in Poland. The founder of Solidarity, Lech Walesa, credited John Paul II with giving Poles the courage to demand change. It has also been widely alleged that the Vatican Bank covertly funded Solidarity. He has been credited with being instrumental in bringing down Communism in Central and Eastern Europe, by being the spiritual inspiration behind its downfall. He was the second longest-serving pope in modern history after Pope Pius IX, who served for nearly 32 years from 1846 to 1878. Wojtyla became the 264th pope according to the chronological list of popes, the first non-Italian in 455 years. Several theories exist concerning Mehmet Agca`s assassination attempt. Agca was born in the Hekimhan district, Malatya Province in Turkey. As a youth, he became a pretty criminal and a member of numerous street gangs in his hometown. He became a smuggler between Turkey and Bulgaria. He claims to have received two months of training in weaponry and terrorist tactics in Syria as a member of the Marxist Popular Front for the Liberation of Palestine paid for by the Communist Bulgarian government, although the PFLP has denied this. After training he went to work for the far-right Turkish Grey Wolves, who were at the time destabilizing Turkey, which led to the 1980 Turkish coup dètat. It has been claimed ultranationalist Grey Wolves were being used by the CIA. For instance, according to Kendal Nezan of the Kurdish Institute of Paris, they were infiltrated and manipulated by the Operation Gladio «Stay-behind» networks, a NATO clandestine structure. In 1979, he murdered Abdi Ipekci (Editor of the major Turkish newspaper Miliyet) under order from the Grey Wolves. He was caught due to an informant and was sentenced to life in prison. After serving six months, he escaped with the help of Abdullah Catli, second-in-command of the Grey Wolves and a prominent Gladio operative, and fled to Bulgaria, which was a base of operation for the Turkish mafia. According to Reuters, Agca had «escaped with suspected help from sympathizers in the security services». On 13 May 1981, Agca`s plan (according to himself) was to open fire in St. Peter`s Square and escape to the Bulgarian embassy under the cover of the panic generated by a small explosion. On May 13 he sat in the square, writing postcards and waiting for the Pope to arrive. When the Pope passed him, Agce fired several shots and wounded him, but was grabbed by spectators and Vatican security chief Camillio Cibin and prevented from finishing the assassination or escaping. Four bullets hit John Paul II, two of them lodging in his lower intestine, the others hitting his lift hand and right arm. Two bystanders were also hit. Celik panicked and fled without setting off his bomb or opening fire. The Pope survived the assassination attempt. Agca was sentenced in July 1981 to life imprisonment in Italy for the assassination attempt. After serving almost 20 years of a life sentence in prison in Italy, Agca was pardoned by the then Italian president Carlo Azeglio Ciampi in June 2000 and deported to Turkey. Agca was extradited to Turkey in 2000 by benefiting from the Conditional Amnesty Law. In early February 2005, durig the Pope`s illness, Agca sent a letter to the Pope wishing him well and also warning him that the world would end soon. While in prison in 2007, he claimed to convert to Christianity. He claimed to be the Messiah at his trial and has made many bizarre statements over the years, although it has never been clear whether he is mentally unstable or merely acting. On May 2, 2008, Agca asked to be awarded Polish citizenship as he wished to spend the final years of his life in Poland, Pope John Paul II`s country of origin. Agca was released from jail on January 18, 2010. He was transferred to a military hospital in order to assess if, at 52, he was still fit for compulsory military service. The military found him unfit for military service for having «antisocial personality disorder». On April 2 2005, Pope John Paul II died in his private apartment of heart failure, 46 days before his 85th birthday. He had no close familiy by the time of his death. Present at the bedside was a cardinal from Ukraine, which is an heavily Orthodox nation. The former assassin visited the tomb of John Paul II on the 27 December 2014.